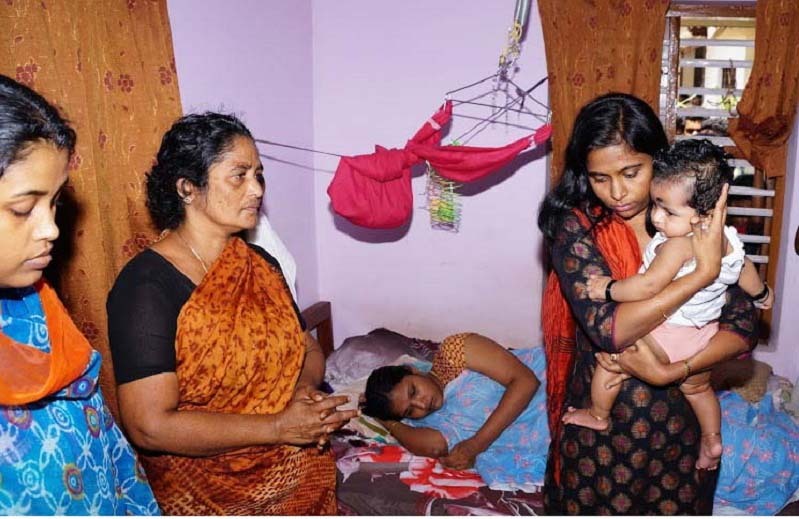 The image above is of A Shainamol, District Collector of Kollam District, Kerala, holding in arms the infant of Martyr Lance Naik B Sudheesh, who hailed from Kollam. Martyr Lance Naik Sudheesh made the ultimate sacrifice in Siachen on 03 February 2016. (Please Click Here to Read More). From the way Shainamol is dressed, her expression, her body language and the way she is carrying the infant, it is evident that it was not for a photo op. My gratitude to Veteran Commander MS Vinod Kumar of Indian Navy for prompting me to write an article on Shainamol. 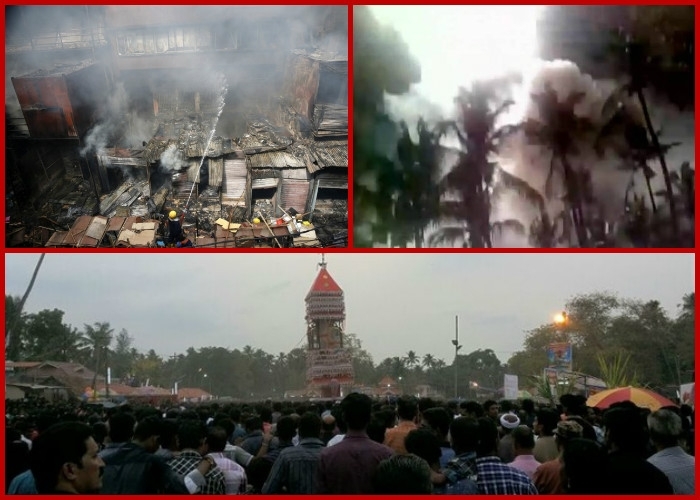 The fireworks accident at Puttingal temple in Kollam District on 10 April 2016 was the deadliest in the state’s history, but surely will not be the last. Fireworks and accidents are associated not only with the Hindu Temple festivals, but also Christian Churches, who are not lagging behind; in some places, they would out do the Temples. The first major fireworks accident reported was way back in 1952 at Sabarimala in which 68 people died and many were maimed. Rough estimates show that in the last 50 plus years, there have been more than 400 such accidents and they have claimed at least 500 lives. The famous Trissur Pooram in Central Kerala, sponsored by the State run Kerala Tourism, is known for its multiple rounds of competitive firework displays, has been hit thrice with high casualties and injuries. In 1987, 27 people who were watching a fireworks display at the Jagannatha Temple at Thalassery got run over by a train. As the fireworks proceeded, the crowd kept retreating until they reached the nearby railway track. Due to the high decibel levels, they suffered from a temporary Noise Induced Hearing Loss (NIHL) and did not hear the approaching train, even though the engine driver of the train had sounded the siren. The next malady is parading elephants during these festivals, ending in accidents, resulting in causalities. The elephants get disoriented with the high decibel sound from the fireworks and the crowds cheering and jeering. These elephants run amuck, killing or injuring people and damaging property. In some cases causalities have been caused by stampedes. Whom are these devotees trying to please? Which God wants animals to face hardships? Even the Gods would tremble at the high decibel levels and fire? Why do all places of worship, irrespective of religion, blare their prayers and hymns at high volume? Else the Gods may not hear! – The Gods possibly suffer from NIHL by now! The same story gets repeated over the years. Neither the religious authorities, nor the political leadership want to take any step to curb the practice. In Indian democracy who would like to antagonise the Gods, taking into account the imperative needs of the vote bank politics. The only way out is for the Judiciary to step in. The judiciary did step in. The Kerala High Court on 12 April 2016, banned the display of sound-emitting firecrackers in all places of worship in the state after sunset. It, however, allowed the use firecrackers, not more than 140 decibel, during daytime. The very same High Court, on 14 April 2016, ruled permitting fireworks display for Trissur Pooram provided there was no unauthorised chemicals used and the sound level not to exceed 125 decibels. The reason cited for the ruling was that the Pooram celebrations was part of the social and cultural fabric of Trissur. The irony is that the High Court is well aware that neither the administration nor the police is equipped with any equipment or instruments to monitor the clauses of high decibel or unauthorised chemicals. In case of any disaster, the Kerala Police is untrained to deal with it, the Fire Department is ill equipped and the Emergency Ambulance services inadequate. To compound the problem further, the exit routes would invariably be clogged by various vendors or vehicles parked illegally. Here too the Judiciary lost and the Gods won. The developed world too have fireworks display, at a much grander scale, but they employ advanced pyro-techniques. They have strict regulations on the decibel levels and the chemicals being used. The regulators are well equipped and ensure applications of the rules. The Emergency services – Police, Fire and Ambulance – are all stand-by mode in more than adequate numbers. The area is cleared of any bottlenecks for exit and entry of people. It is obvious that any social evil cannot be stopped by rules and regulations, but only by self-restraint. Kerala state boasts of near 100% literacy, but has failed to make its people aware of the disasters awaiting them. To add fuel to the fire, the emergence of the ‘Hindutva’ Brigade, duly supported by the political party in power at the centre has set their own propaganda machinery. These propagandists claim that the rules to curtail the celebration of Hindu festivals are the deliberate works of the political leadership and administration, to belittle the majority population! In the case of the fireworks accident at Puttingal temple, the state was ruled by a Christian Chief Minister; local Member of the Legislative Assembly (MLA) is a state minister and also a Christian; District Collector is a Muslim, so also the Additional District Magistrate. With the state going to the polls in the following month, can anyone stop the social evil of the fireworks display at a Hindu Temple? Shainamol, the District Collector and Shanavas, the Additional District Magistrate had denied permission for the fireworks at Puttingal temple. They were reportedly bullied and threatened by local politicians and Hindu groups, with communal motives attributed to their actions. The temple authorities managed to get the support of political parties and coerced the Police and went ahead with the fireworks, despite the ban from the collector. Since it was election time, the temple authorities were confident that no one would stop them. It left over 100 devotees dead and over 300 injured. Kerala Police was quick to transfer the blame for the accident on to the District Administration. Shainamol courageously stood her ground and went public through the media, explaining her position. The political masters did not digest this act and the State Cabinet censured Shainamol for airing her views in public. She did not relent and did not budge from her position. Shainamol comes from a devout Muslim family in Kerala. Her father S Abu and mother PK Sulekha are proud parent today, as three of their children qualified the civil services exams. 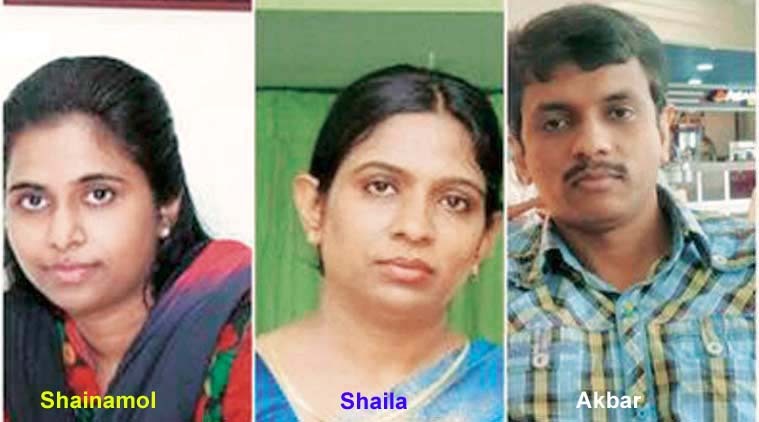 Her elder sister A Shaila is the Mumbai District Collector and her elder brother A Akbar is the Superintendent in Kerala Police Crime Branch. Her father Abu, a retired school teacher, is all praise for his three children, crediting their determination, hard work and constant prayers for their success. He is ever thankful to Allah for letting his children reap the benefit of their hard work. Abu’s advice to parents is that the children should be given ample opportunity for studies, a congenial atmosphere at home, time and basic amenities. The Muslim community of Kerala are now realising that advancement in social and economic fields can come through education. Shainamol believes that the future belongs to young people and therefore there is an urgent need for the Muslim community to get rid of its backwardness. She opines that there is a need for an attitudinal change with more emphasis on education and employment generation programmes. Let us all stand together and support Shainamol in all her future endeavours. ← Where did the Air Conditioner Go? Shainamol deserves our praise and support. Fireworks per se is not bad – it is also an art form. In Kerala unsafe fireworks with emphasis on sound is the problem. Fireworks are a visual delight all over the world, with safe pyro techniques without much sound. The Sydney New Year fireworks is one such example. ( one church in Kerala recently did a similar ” Digital fireworks” – a good example for others to follow). No govt / political party is willing to enforce safe celebrations – obviously for petty political reasons.. they do not wish to annoy any religion. The courts are also helpless – they have no executive powers. The only solution is to create awareness and people must put pressure on govts to act. The initiative must come from the religious organisations who must do some self -regulation. It is hightime that the deafening & polluting fireworks,that cause miseries to aged & sick people, especially to those with breathing problems, as well as to the animals, are substituted with ‘digital fire works’. Only the judiciary will be able to ban this menace, which some religious leaders consider as their birth- right. It is not unusual for the Government to Hush-Hush truth. However it takes courage to speak up and much more to speak for. Let sense prevail over emotions. We are a country of rouges. Citizens take immense pleasure in breaking rules and defying logic. Our Netas & Pundits ( of all religions) are the culprits. In the name of religion, votes and personal gain they will go to any extent even at the peril of citizens. Something is seriously wrong here. People will get what they deserve. Unless the populace wakes up and fight for their rights, situation will remain the same. Excellent article.. Just shows how the political system in our country is skewed. An excellent impartial view on the bold lady Shainamol. The state admin and religious groups may give a communal colour to her denying permission for fireworks. Home minister was in full support for his chamcha force and is constantly shielding the corrupt police of Kerala. Parents of Shaina and siblings have to be so proud that they have given the best children to the nation. It takes its toll on the administrators to enforce law. There is tremendous pressure on them from various quarters to allow deviations. It is all the more saddening when very limited support is forthcoming from their own organisation as well as by the media. They may also end up being sidelined in their profession for actions taken in compliance of the laws of the land. A vibrant and fearless bureaucracy is essential to the progress of any nation.